Filing a trademark application in the United States or a foreign country typically results in trademark owners receiving unsolicited notices, invoices, and other communications from U.S. and foreign companies requesting fees for trademark-related services, such as trademark monitoring and document filing. Although these documents and invoices often look “official” and contain customer-specific information (such as the trademark serial or registration number and owner name), companies that offer these services are not affiliated or associated with the United States Patent and Trademark Office (“USPTO”) or any other federal agency. If you receive an invoice related to your trademarks, you should verify its authenticity with your trademark attorney, the World Intellectual Property Organization (WIPO) or the Intellectual Property Office through which your mark is registered before remitting payment and to discuss your options in more detail. Unless the communication comes directly from (1) the USPTO, (2) a foreign trademark agency equivalent, or (3) your trademark attorney, these notices and invoices are likely unsolicited third party advertisements for services that you may not need or that may not provide you with adequate protection for your trademarks. The USPTO and the WIPO have issued warnings related to these unsolicited requests for payment of fees. WIPO has databases containing samples of misleading invoices and similar announcements issued by various countries. You may file a complaint about these types of solicitations with the Federal Trade Commission (FTC). Although movies, TV shows, art, books, musi c, lyrics and recordings are protected by copyright, the titles, names and tag lines associated with these types of creative works do not qualify for copyright protection. However, in certain instances, titles of creative works may be protectable as trademarks. However, if the title has been (or will be) used in connection with a series of creative works (e.g., a series of books, the second edition of a book with significant changes, a periodically issued magazine, a television or movie series, a series of live performances [such as by a musical artist], educational seminars, or a continuing radio program), it may constitute a mark for either entertainment or educational services. For more information about how to protect titles, here’s an article I wrote entitled “A Different Kind of Title Insurance: How to Protect Titles of Creative Works” that was published in Bloomberg BNA’s Patent, Trademark and Copyright Journal. Use of the ™ or SM Symbols. Unless and until you obtain a federal trademark registration for your mark(s), you can (and should) use the ™ or SM (for trademark and service mark, respectively) symbol in connection with your marks to indicate to others that you claim rights in the marks. You do not need to have filed a state or federal trademark application or obtained a trademark registration to use the ™ or SM symbol, as common law trademark protection subsists from the time a mark is first used in commerce…although there are several benefits to registration. You may also want to include a trademark notice on your documents and website. Example: I’M WITH THE B(R)AND SM is a service mark of Danica L. Mathes. Use of the Federal Registration Symbol ®. You cannot use the federal registration symbol ® until you receive a federal registration certificate from the U.S. Patent and Trademark Office (USPTO). 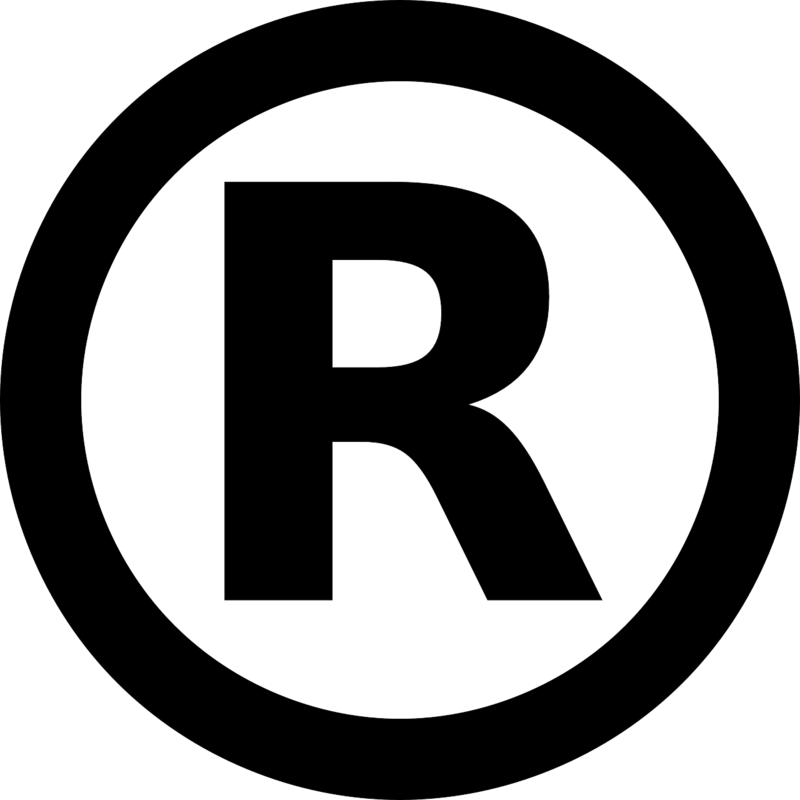 Even if you have a pending trademark application, the registration symbol may not be used before the mark has actually registered. The federal registration symbol should only be used on goods or services that are the subject of the federal trademark registration. Example: CAST A BIG SHADOW.® is a registered service mark of Bell Nunnally & Martin LLP. NOTE: JUST BECAUSE A MARK IS REGISTERED FOR ONE ITEM DOES NOT MEAN YOU CAN USE THE ® FOR OTHER ITEMS. If a specific product or service is not listed in the identification of goods/services for a registered mark, then ™ or SM would be the correct notice to use in that case. Trademark Notices in Other Countries. Some countries have severe civil and criminal penalties for improper use of trademark registration symbols. Therefore, you should not use ® in countries where your marks have not been registered. If you are unsure if a trademark is registered in a particular country, you should use the ™ or SM symbol. NOTE: IN MANY INSTANCES, YOU WILL LIKELY NEED PERMISSION FROM THE OWNER OF A MARK IN ORDER TO USE THAT PARTY’S MARK…especially if use of a third party mark is likely to lead consumers to believe that there is an affiliation, connection or association with the third party mark or that the owner of the third party mark sponsors, approves or originates your products, services or commercial activities. To prevent unauthorized use or copying of your works, you should always include a copyright notice on all documents, websites and other creative works. Although the use of a copyright notice is not required under U.S. law for works published after March 1, 1989, it’s a good way to potentially deter would-be infringers. You do not need to have filed a copyright application or obtained a copyright registration to use the ©, as copyright protection subsists from the time the work is fixed in any tangible medium of expression (e.g., written down, recorded, etc. )…although there are several benefits to registration. Use of a copy right notice informs the public that the work is protected by copyright, identifies the copyright owner, and shows the year of first publication. Furthermore, in the event that a work is infringed, if a proper notice of copyright appears on the published copy or copies to which a defendant in a copyright infringement suit had access, then the alleged infringer will not be able to rely on a defense based on innocent infringement in mitigation of actual or statutory damages. © 2015 Danica L. Mathes. All rights reserved. COPYRIGHTS – Copyrights protect creative works. Technically, copyrights protect “original works of authorship” that are “fixed in any tangible medium of expression,” such as literary and musical works; pictorial, graphic, and sculptural works; computer software; motion pictures and other audiovisual works; sound recordings; and architectural works. Copyright protection exists from the moment the work is written down, recorded, photographed, etc. Copyright protection usually lasts for the life of the author plus 70 years. Copyrights are protected by U.S. federal law (17 U.S.C. § 101 et seq.) and international treaty. (Note: You do not have to file for a copyright registration to have federal copyright protection…but there are several advantages to obtaining a registration.) For more information, visit www.copyright.gov. TRADEMARKS – Trademarks are brand names and logos that are used on products or in connection with services. A trademark is a word, phrase, name, slogan, tagline, logo, domain name, symbol, device, or any combination of these, which is used (or intended to be used) in commerce to identify and distinguish the goods or services of one entity from those sold or provided by others, and to indicate the source of the goods or services. A trademark also stands as a symbol of the quality which people expect in products sold and services provided in connection with a mark. Trademarks can include trade names, logos, domain names, 800 numbers, advertising slogans, jingles, and store designs. Trademark protection can last as long as a mark is used in commerce. Trademarks are protected by common law, state law, U.S. federal law (15 U.S.C. §§ 1051-1141n) and the laws of individual foreign countries. For more information, visit http://www.uspto.gov/. Service Marks – A service mark is basically the same as a trademark except that it identifies a service instead of a product. For practical purposes, the same rules apply to service marks as apply to trademarks. Trade Dress – A product’s trade dress, which includes product features and configurations such as shape, texture, size, color and packaging, may also be protected if it is “nonfunctional.” A feature is functional if it is necessary to a product’s utility, or affects its cost and/or method of manufacture. However, if other, different physical features can perform the same function without sacrificing a functional advantage, the design may be considered nonfunctional. Trade Names – A trade name is the name under which an entity does business, such as Bell Nunnally & Martin LLP. A trade name encompasses the reputation of the entire business while trademarks and service marks identify specific products and services sold by that business. No particular notice or usage is required for trade names. It is usually not proper to use the trademark symbol with the trade name. PATENTS – Patents protect inventions and improvements to existing inventions. A patent is a property right granted to an inventor by the government. Patents can be granted to anyone who “invents or discovers any new and useful process, machine, manufacture, or composition of matter, or any new and useful improvement thereof.” Patents confer the right “to exclude others from making, using, offering for sale, or selling” the invention in or “importing” the invention into the U.S. for a limited time in exchange for public disclosure of the invention when the patent is granted. Patents are protected by U.S. federal law (35 U.S.C. § 1 et seq.) and the laws of individual foreign countries. For more information, visit http://www.uspto.gov/. TRADE SECRETS – A trade secret generally includes any information that derives independent economic value from not being generally known or reasonably ascertainable, and is the subject of reasonable efforts to maintain its secrecy. Trade secret protection can last as long as the secret is kept. Trademarks are protected by common law, state law (most states follow the Uniform Trade Secret Protection Act), U.S. federal law (18 U.S.C. § 1839(3)) and the laws of individual foreign countries. Practically, trade secrets are usually maintained through nondisclosure and noncompete agreements.